Looking for a New Kia Soul in your area? 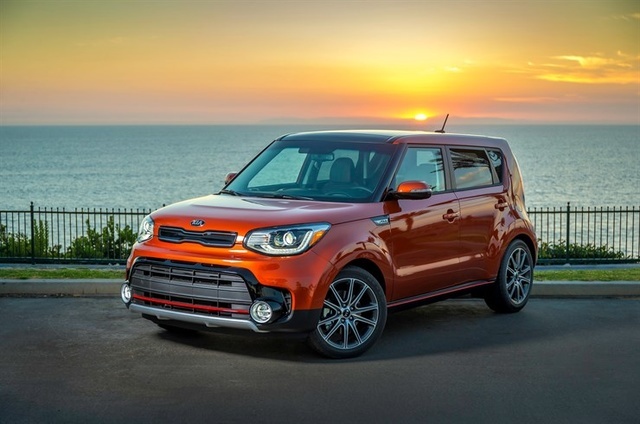 CarGurus has 817 nationwide Kia Soul dealers with 44,249 new car listings. The original Kia Soul hit the market in 2009 to critical acclaim, and at a time when the subcompact crossover segment was relatively new. Now well into its second generation and having seen off most of its similarly boxy counterparts (Nissan Cube, Scion xB), it continues to deliver affordable quality and style in spades. Likely closer than not to a full redesign, the little Kia’s handsome bulldog-like styling nevertheless shows no signs of aging against fresher competitors, and it remains up-to-date on all of the latest gadgets. For 2017, the Soul received a subtle facelift that included revised front and rear fascias, new interior finishes, and a range-topping turbocharged powertrain. For 2018, it carries on with just minor changes. The Soul offers just three trims, Base, Plus and Exclaim; the latter two are stylized in Kia marketing as “+” and “!,” respectively. The primary difference between each of these trims is the engine. The $16,100 Base trim houses a 1.6-liter inline 4-cylinder engine and a 6-speed manual transmission, which outputs 130 horsepower and 118 pound-feet of torque and which is good for 24 mpg city/30 highway/27 combined. Opt for the automatic transmission and the price climbs to $17,700, but fuel economy increases slightly to 25/30/37. The Plus (+), retailing for $20,300, is the volume trim and enlarges the engine to a 2.0-liter inline 4-cylinder unit that makes 161 horsepower and 150 lb-ft of torque, paired with a 6-speed automatic transmission. Fuel economy remains unchanged from the Base with automatic transmission, at 25/30/27. The $22,000 Exclaim trim’s 1.6-liter turbocharged inline 4-cylinder engine brings a hearty 201 horsepower and 195 lb-ft of torque and is married solely to a 7-speed dual-clutch transmission, Surprisingly, it is this configuration that is the thriftiest on fuel, at 26/31/28. Fuel economy overall is mid-pack for this segment, although much larger vehicles, like the Honda CR-V, Hyundai Tucson, Nissan Rogue and Toyota RAV4, match or exceed the Soul’s numbers. The option of all-wheel-drive (AWD) is absent in every configuration, notable because every one of its competitors offers 4-wheel motivation. Kia even acknowledges this by marketing the Soul as an “urban passenger vehicle.” As for performance, critics say it depends upon the engine. The 1.6-liter and 2.0-liter powerplants propel the Soul in a way that is leisurely, yet adequate, and certainly in keeping with similar powertrains from other subcompact crossovers. However, the 1.6-liter turbo engine’s extra oomph pairs with the Soul’s naturally balanced chassis tuning and well-calibrated brakes to earn it true hot-hatch credibility. In any configuration, Base, Plus or Exclaim, the Soul is remarkably easy to drive on a day-to-day basis. For technology and features, the trims are defined as much by what they include as what they offer as options. The Soul’s Base trim comes with 16-inch alloy wheels, a color infotainment system, Bluetooth, Siri EyesFree, voice commands, an illuminated glovebox, USB and auxiliary jacks, 12-volt outlets, rear split-folding seats, and steering-wheel-mounted audio controls. Despite the generous list of standard technology features, the manual-transmission Soul foregoes rudimentary equipment that would be included on competing vehicles, such as keyless entry, cruise control, and a front center console with armrest, but these are included with the automatic transmission upgrade. For packages, there is only the $1,200 Convenience Package, which must be paired with the automatic transmission and brings along a 7-inch touchscreen, Android Auto, Apple CarPlay, automatic single-zone climate control, automatic lights, and a reversing camera. The volume Plus trim includes everything from the Base trim with Convenience Package, and in addition, 17-inch alloy wheels, heated exterior mirrors, body-colored front and rear bumper inserts and fog lamps. The Plus’s $1,500 Audio Package swaps the 7-inch infotainment system for a larger 8-inch one that includes navigation and telematics, a Harman Kardon audio system with a center speaker, subwoofer and external amplifier, speaker lights, dual center console USB charging ports, piano black interior accents, satin chrome interior door handles, a leather-wrapped steering wheel and gear lever cover, and leatherette on the doors and dashboard. The Audio Package is a prerequisite to the steeply priced $4,500 Primo Lit Package; this includes autonomous emergency braking, forward collision warning system, smart cruise control, blind-spot monitoring, rear cross-traffic alert, panoramic sunroof, HID headlamps with auto leveling, LED daytime running lamps, LED interior lighting, leather trimmed seats, and heated front and rear seats and steering wheel. The Plus is also the only trim with the $400 Designer Collection package that adds specialized color combinations—including some optional two-tone paint jobs—18-inch alloy wheels with gloss black inserts and a leather-wrapped steering wheel. The Exclaim trim brings to the table 18-inch alloy wheels, gloss black front and rear bumper inserts, tasteful cloth/leather combination with contrast stitching, a smart key, and an immobilizer. The Technology Package, at $3,000, includes blind-spot monitoring, rear cross-traffic alert, HID headlamps, LED daytime running lamps, fog lamps and tail lamps, power-folding side mirrors, an 8-inch touchscreen infotainment system with navigation and telematics, a Harman Kardon audio system with a center speaker, subwoofer, and external amplifier, speaker lights, dual center console USB charging ports, heated front seats, rear seats, and steering wheel, and powered front seats. On top of the Technology Package, buyers can pony up an additional $1,000 for the Sunroof Package and earn a panoramic sunroof and LED interior lighting. While the Soul’s boxy shape might be a detriment to fuel economy, it's an asset to interior volume. Cargo space measures 24.2 cubic feet and 61.3 cubic feet with the rear seats folded (and these seats do not fold completely flat), shaming many of the Soul’s sleeker-shaped competitors, especially the Mazda CX-3, Nissan Juke, and Toyota C-HR, but also exceeding the Nissan Rogue Sport and Jeep Renegade. Unlike many of its cramped rivals, the Soul promotes excellent use of a diminutive footprint. On the safety front, every Soul comes equipped with dual front and side airbags, full-length side curtain airbags, disc brakes at all four corners, and intelligent electronic brakeforce distribution. This is good enough to earn the Kia commendable ratings from the Insurance Institute for Highway Safety (IIHS), including a top rating of Good in all crash categories. For the ability to avoid or mitigate a crash, it earns a score of Good with the optional driving aids in the Primo Lit and Technology Packages. Its only imperfect IIHS score is an Acceptable rating for the ease-of-use of its child-seat anchors. In summary, the Soul essentially combines the attributes of its more-parochial competitors and distills them into a package that does everything reasonably well. The Mazda CX-3 is sporting, the Honda HR-V is roomy, and the Jeep Renegade is stylish; however, none of these can match the Soul’s magic combination of being a daily driver that is simultaneously spacious, handsome, and—with the optional turbocharged engine—quite enjoyable to drive. Its high hip-point and steeply raked windshield give younger drivers a commanding view of the road and older drivers an astoundingly easy ingress and egress procedure; the squared-off cargo-hold is just as good for wheelchairs and mobility equipment as it is for bulk-buying errands or camping gear. The Soul undercuts its rivals on price, but also comes in base form at a lower level of equipment than those competitors are willing to offer, but overall, pricing is competitive with the segment. With a light hand on the options sheet and the willingness to forego AWD, the Soul provides an extraordinary experience for an ordinary price, which should quell any notion that Kia’s smaller vehicles are still unpleasant penalty boxes. What's your take on the 2018 Kia Soul? GuruC7TR3 Superior if you want sit up straight and drive like you mean it. A bit boxy and that is ok. if you want to recline back and drive like you just don't care this is not for you. Have you driven a 2018 Kia Soul? Enter your zip to see incentives for a new Soul in your area. CarGurus has 28,293 nationwide Soul listings starting at $2,799. I am driving a new Kia Soul and when I'm driving slowly it feels as if the brakes are engaged, not fully, but enough to make it feel like it's dragging. Anyone have that experience?